We are inaugurating our Brainy Certified: Mind Blowing Art series by using our first edition to showcase none other than the masterpiece created by Damien Hirst. The piece is titled The Physical Impossibility of Death in the Mind of Someone Living. It would be difficult to begin any conversation of incredibly eye-opening artworks without talking about this piece. What is the artwork of? Essentially, it’s just a tiger shark preserved in a vitrine. But what does it mean? The mind-boggling name holds the answer. The Physical Impossibility of Death in the Mind of Someone Living. The name is art in itself. It almost seems like the awkward title stumbles on itself. It catches your eye; you know it’s profound, yet it takes a minute to sink in. Damien Hirst is notorious for creating works that deal with death. The title eloquently tells you that the work is about living people’s unwillingness to accept death. The title is enough of a mind bender. It’s not just about how people are afraid to think about death, it’s about the physical impossibility of death. The piece is concerned with directly showing its viewers that the failure to accept an inevitable death is illogical. The perfectly crafted phrase highlights exactly what Hirst is addressing. As opposed to the complex title, the artwork is actually quite simple. That is, if you consider a 13-foot tiger shark preserved in a tank of formaldehyde to be within the bounds of simplicity. 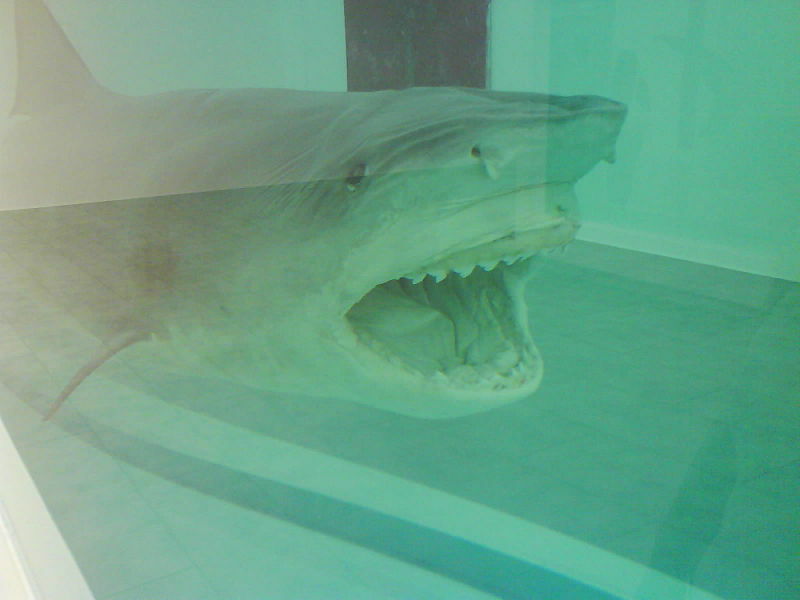 Hirst had a shark hunted specifically for this project. Art legend Charles Saatchi commissioned it, and even funded the expensive project. At first, many people thought this was going to be a waste of time and money. In the end it was sold for somewhere in between 8 and 12 million dollars. Needless to say, it made a big impact on the art world. The whole piece weighs in at 23 tons. It is displayed in a giant glass and steel tank, which is divided into three cubic sections. The shark is placed in the middle. The shark is a replacement of the original. The original shark, when the piece was first commissioned, began to slowly rot due to poor formaldehyde solution mixing. The new shark was better fitted and it is expected to last 200 years. If the title doesn’t blow your mind itself, the actual display will for sure. There’s something so raw and visceral about the piece that demands your fullest cognition. People try to avoid thinking about death. They don’t grasp it. That’s not a good thing. It shouldn’t be allowed to happen. Death is this big scary shark coming your way. You can’t just ignore it. The shark isn’t going to keep still like it would in a big vitrine filled with formaldehyde. And neither is the end of your life. 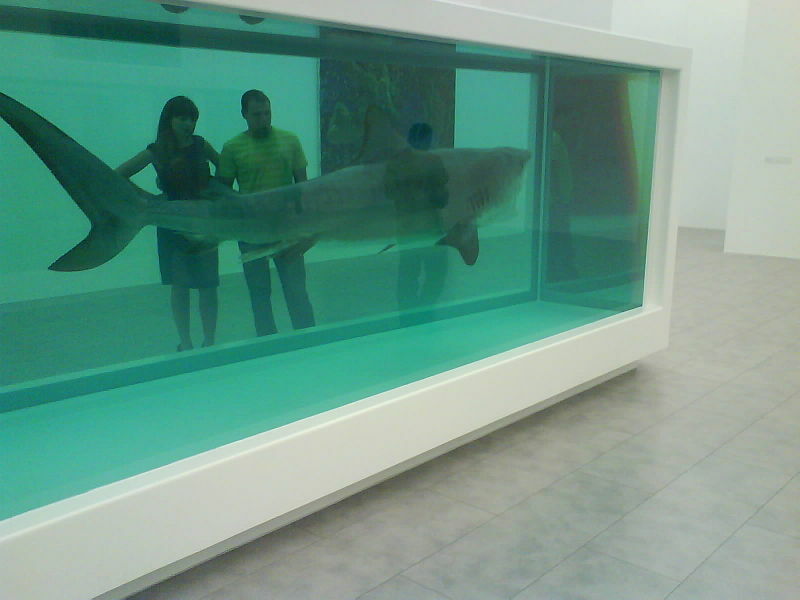 It’s amazing how Hirst says all this with just a shark in a tub. The shark is positioned in a way where its mouth is open. It looks scary. Even though you know the shark is dead, it’s unsettling to look at. The shark is death. It’s this scary unwelcome thought. It is not a pleasant thought that you happily welcome. Many people argue that using a real shark was unnecessary. They ague that it is a bad step in our relationship with nature. Hirst argues that he needed a real shark. Without a real shark you wouldn’t feel frightened. It needed to feel real. It needed to be as real as death. If you don’t feel something you won’t remember the piece as strongly. This piece does wonders by really making you feel something. The emotions felt are strong. It lets you know that you really can’t avoid death. It really is impossible. It shows you that death is this inevitable frightening thing. It’s coming. It forces you to think about your time left on this earth. Whether you agree with the message and the means or not, it’s hard to disagree with the fact that this piece gets you thinking. It imprints itself into your mind. For this reason, we have determined that The Physical Impossibility of Death in the Mind of Someone Living is a Brainy Certified worthy mind blowing art piece.